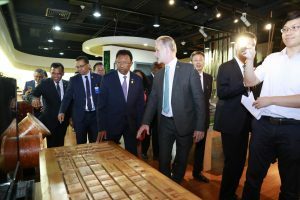 The President of Madagascar, Hery Rajaonarimampianina visited INBAR’s Headquarters in Beijing and believes there is immense potential for bamboo and rattan to help his country’s growth. 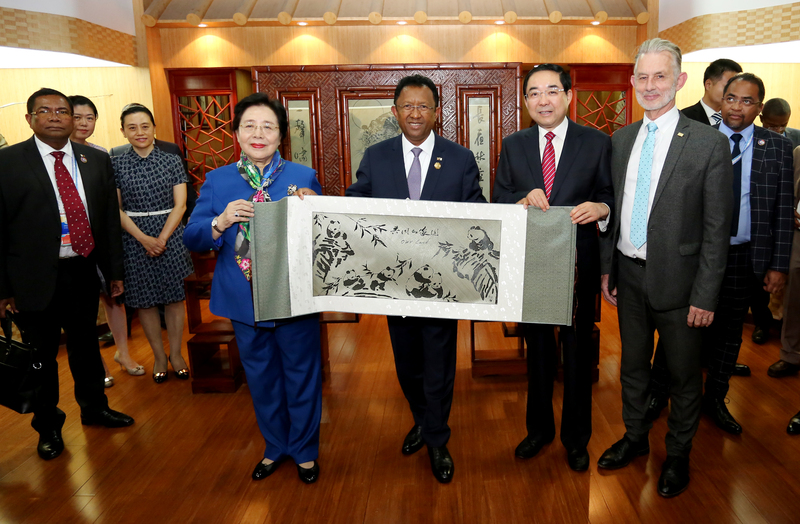 On Wednesday 5 September INBAR welcomed the President of Madagascar, Hery Rajaonarimampianina, to their Headquarters in Beijing. Madagascar joined INBAR in 2004 and is the 28th state member of INBAR. 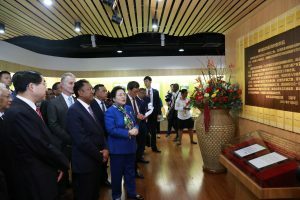 Co-chair of INBAR Prof. Mme Jiang Zehui, Director-General of INBAR Dr. Hans Friederich, and Vice-Minister of the National Forestry and Grassland Administration of China Zhang Yongli, accompanied the President on a tour of the bamboo and rattan showroom. Madagascar is well known for its rich natural resources, and there are some 40 species of bamboo on the island. There are some initiatives on the island using bamboo for rural development, but a lot more can be done to promote sustainable development. The visit to INBAR’s Headquarters allowed President Rajaonarimampianina to appreciate the potential of bamboo and rattan, and to see first-hand what can be manufactured from these two plants. 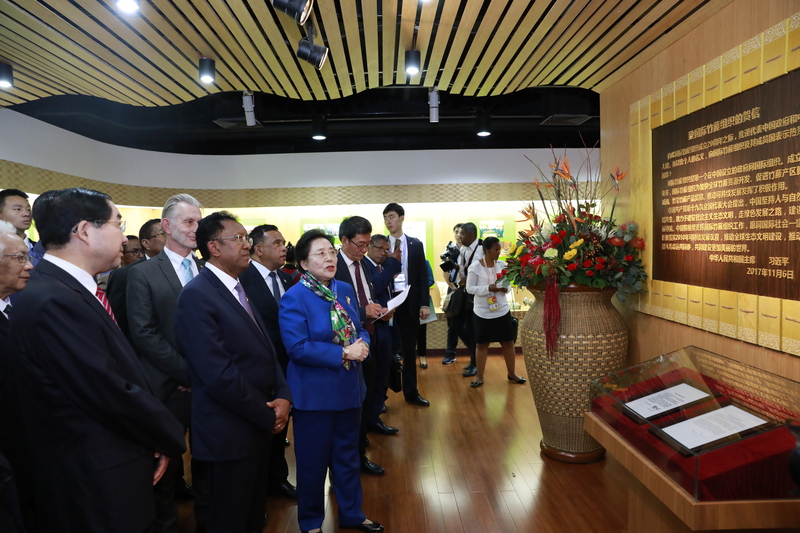 INBAR Director-Gener al Dr Friederich provided a guided tour for His Excellency and explained the various products that have been produced from bamboo. 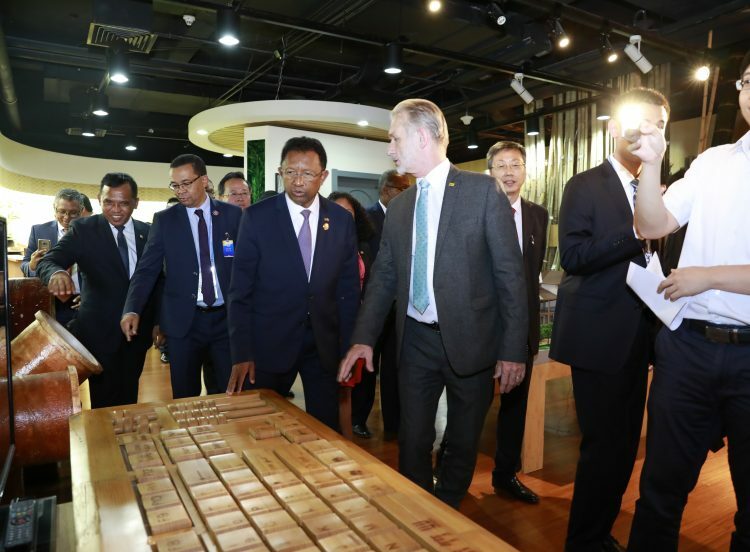 President Rajaonarimampianina was impressed by the various household items, construction material, textile and drainage pipes made from bamboo, and he was particularly interested in bamboo flooring, bamboo curtains and bamboo charcoal. Madam Jiang Zehui introduced President Rajaona rimampianina to recent letters of appreciation from Chinese leaders and presented him with a bamboo weaving featuring giant pandas manufactured in Meishan City, Sichuan Province on behalf of INBAR.